Among the most dynamic Aboriginal peoples in western Canada today are the Ojibwa, who have played an especially vital role in the development of an Aboriginal political voice at both levels of government. Yet, they are relative newcomers to the region, occupying the parkland and prairies only since the end of the 18th century. This work traces the origins of the western Ojibwa, their adaptations to the West, and the ways in which they have coped with the many challenges they faced in the first century of their history in that region, between 1780 and 1870.The western Ojibwa are descendants of Ojibwa who migrated from around the Great Lakes in the late 18th century. This was an era of dramatic change. Between 1780 and 1870, they survived waves of epidemic disease, the rise and decline of the fur trade, the depletion of game, the founding of non-Native settlement, the loss of tribal lands, and the government's assertion of political control over them. As a people who emerged, adapted, and survived in a climate of change, the western Ojibwa demonstrate both the effects of historic forces that acted upon Native peoples, and the spirit, determination, and adaptive strategies that the Native people have used to cope with those forces. This study examines the emergence of the western Ojibwa within this context, seeing both the cultural changes that they chose to make and the continuity within their culture as responses to historical pressures.The Ojibwa of Western Canada differs from earlier works by focussing closely on the details of western Ojibwa history in the crucial century of their emergence. It is based on documents to which pioneering scholars did not have access, including fur traders' and missionaries' journals, letters, and reminiscences. Ethnographic and archaeological data, and the evidence of material culture and photographic and art images, are also examined in this well-researched and clearly written history. 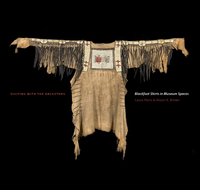 Laura Peers was associate curator for the exhibition Sacred Encounters: Father de Smet and the Indians of the Rocky Mountain West, and co-author, with project director Jacqueline Peterson, of the exhibition catalogue. Together with Jennifer S.H. Brown, she wrote a critical review and preface for a new edition of Harold Hickerson's The Chippewa and their Neighbors.